DevFest DFW is one of the largest Technology conferences in the Dallas-Ft. Worth Area. We have topics ranging from Machine Learning, Web development, User Experience and Design, Mobile app development, Managing and Deploying to the Cloud, and Cloud computation. From the likes of Google, Atlasssian, CapitalOne, Ionic and more! Tickets are only $30 (regular) and $15 for students! Tickets include Lunch, SWAG, and parking. In addition to speakers, we will have developer advocates and technology experts in attendance to answer questions and help you out. 1 Speaker who is a freshman High school student! William J. Francis - Launching an App without Analytics is Crazy Talk! 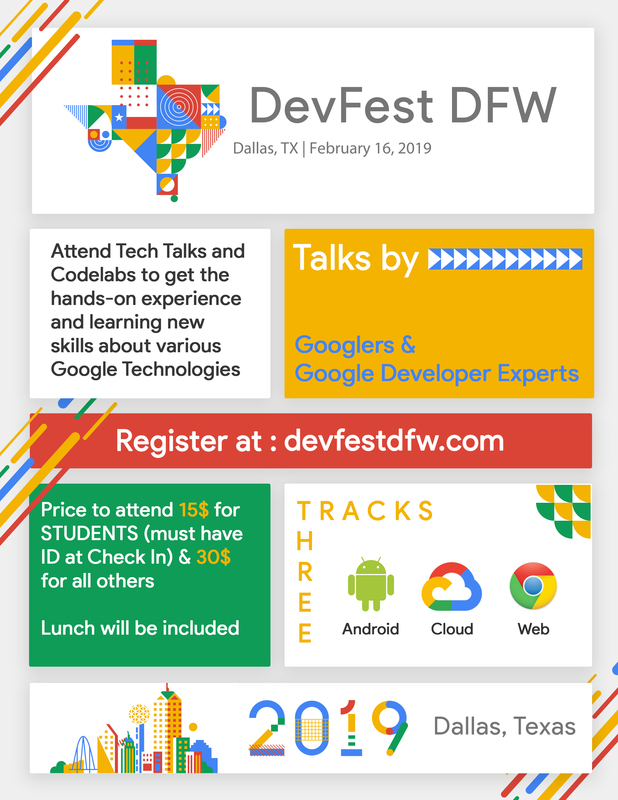 DevFest DFW would greatly appreciate if you would use this flyer to promote the event by putting this in an email or printing out and “tagging” your space!